Photo courtesy of Zach Hoffman. Clean up on Aisle 6! “Kidneys Galore” Franchisee’s are just a bit out of their league here. From the makers of “stars” and “love”. And I thought it was damaged trolly wheels. Does the it have ‘lungs’ too? Does it have ‘lungs’ too? We just had a Mortal Kombat tournament… no, it wasn’t the arcade game… not the home version either. I have a “heart” on for you!!! oh..ha ha i thought i left that somewhere!! oh well!! i’ll buy yours..i can’t bear of seeing ur owned by other! Just look for it in the Coronary section! And don’t forget to try our fresh kidney beans! If your looking…”Heart-On” is across the aisle although is has a little different client. NOTE: In case of a heart attack, call the police, not ambulance! 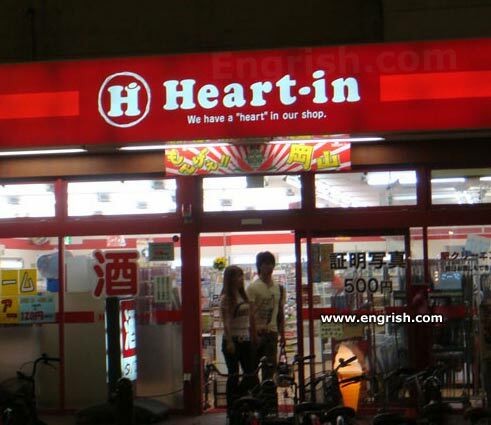 All shops, when they’re open, at least, have hearts in them. You know…they’re inside the customers.